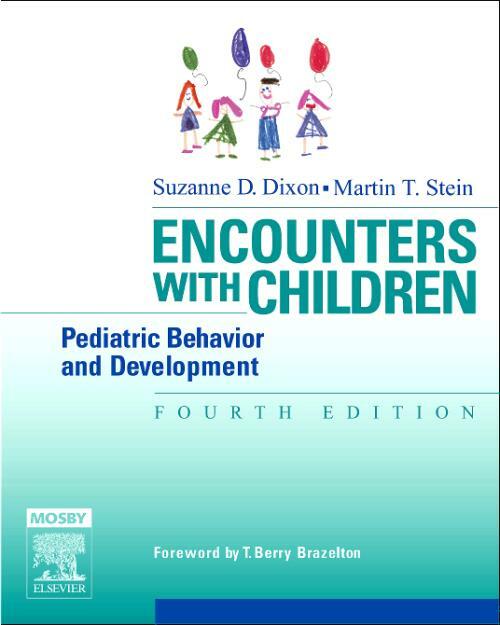 The fourth edition of this unique text continues to provide pediatric clinicians with a practical guide to normal childhood development and behavior. In addition to exploring the normal stages of development, Encounters With Children 4/e addresses many of the familial and societal issues that can influence a child's behavior, such as terrorism and disasters, preschool choices, bullying, and divorce. As in past editions, chapters are logically organized to coincide with the AAP recommended schedule of health supervision visits. Additional topics include ADHD and learning disabilities, autism and other disorders of communication, and dealing with stress. Pediatricians in any stage of professional development will make the most of each well-child visit with this useful, easily digestible text. Dixon, Suzanne D. Emeritus Professor of Pediatrics, University of California, San Diego, La Jolla, CA; Clinical Faculty, University of Washington, Seattle, WA; Great Falls Clinic, Great Falls, MT. Stein, Martin T. Professor of Pediatrics, Director, Developmental and Behavioral Pediatrics, University of California, San Diego, La Jolla, CA.